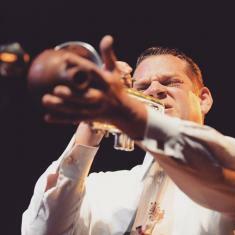 The Alpha Rhythm Kings is a band led by vocalist/trumpet player Robert Dehlinger. They have influences ranging from vintage lounge music, 1940s R&B, swing, and boogie-woogie. It is easy to be mesmerized with their music and creativity. Their debut EP, California Boogie, has four scintillating tracks that each represent musical influences and heroes like Henry Mancini and Don Tosti. It can be considered a homage record with a wide variety of musical flair and flavors even though it only has four tracks. Although relatively new, the Kings do not sound like they are lacking from experience. Q: There was a short-lived pendulum shift to swing music in the late '90s. What did you think of that and were you involved in it at all? A: Yes, I remember that. I was still fairly young. Near the tail end of that swing revival I did join a swing group and we had a pretty easy time getting work. We would play places like the Derby in Hollywood, and there would be a line around the block to get in. I was happy that the swing genre was in vogue, but I did wish that a greater number of the bands from that era had more of an authentic vintage sound. That's just my personal taste. It was definitely a good thing to have musical acts doing swing music and to see young people out there having a blast supporting it. Q: Is the Alpha Rhythm Kings your first group? How did it start for you and was this the genre you've always been involved in? A: I've done a lot of different musical styles, and I've led bands before. I came to this genre by first focusing on jazz, which led me to other related genres, and eventually swing. This is the first time I've been the frontman of a group in the vintage swing vein. I became sort of a specialist in the style after playing trumpet for over 11 years in a band called Stompy Jones. We worked hundreds of nights a year doing authentic jump-blues and swing. Q: When did you learn to sing, and where did you gain the most experience doing vocals prior to performing live? A: I did sing in the high school choir a few semesters, and I sang a lot of background vocals in other bands. I also got a lot of experience over the past 10 years singing for jingles and other musical projects. Q: What are your favorite swing records? A: Wow, that's a tough one to narrow down. I love music by Louis Prima, Roy Milton, Louis Jordan, and the John Kirby Sextet. There are so many. I also enjoy Frank Sinatra, Louis Armstrong, Roy Eldridge, and Harry James. Q: California Boogie strays beyond swing and into lounge music as well. What made you decide to take a more electic approach? A: Swing and jump-blues are definitely the sound for the majority of the material, but I think it's important to add a little variation to your repertoire. I've always been drawn to that classic vintage lounge sound. It's beautiful to me. It's fun, uplifting music, and it transports me to a bygone era. I feel like I'm time traveling. '50s and '60s lounge is a spice that I like to add to the recipe that is the Alpha Rhythm Kings. Particularly tunes by classic composers like Henry Mancini. Q: The band has tight chemistry on the record. How long have you all been together? A: This band is new. We did our first gig at the end of August, 2017. I have a group of great musicians who can come together quickly and create a professional sound. Also, I hired people who I know well. I base my musical personnel decisions partly on personality and attitude. It can be just as important as skill level. Q: What are your plans for the group after this EP? A: We will be recording a full-length album within the next year. Hopefully, it'll be released in early 2019. Q: Does the band gig often? What are those like? A: We are a new band, but we have been rapidly picking up gigs. We are getting quite busy, and I expect that to continue. We play a lot of promoted swing dances, nightclubs, street fairs, theme parks, and the occasional private event. We are also working on doing outdoor festivals. One encouraging phenomenon is that almost every time we play a show, someone comes up to me and says, "You are my new favorite band!" Q: What's the market like in San Francisco for Alpha Rhythm Kings? A: In San Francisco, it seems to be a lot of swing dance events and jazz clubs that book the band. Also, outdoor street fairs and corporate parties. Q: What age groups do normally see represented at your shows? A: Honestly, it's a mix. We have a lot of younger dancers that come to work on their swing dance moves, as well as more seasoned older dancers. At nightclubs it seems to be a mid-twenties to late-forties crowd. But we do see all ages.